Join us to have a good time and to learn about our most precious resource— our WATER! From the aquifer beneath our feet, to our natural springs and rivers, and even to the faucets in our homes, our sources of fresh water are becoming increasingly threatened. It is now time to raise awareness and start working together to protect this vital resource—our natural waters. 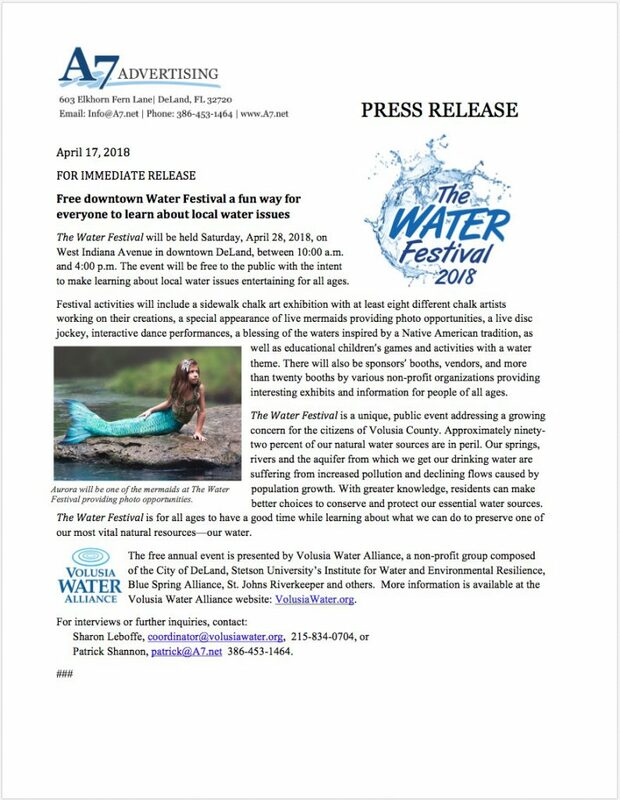 Plan to join us for The Water Festival 2018! Ever seen a LIVE MERMAID? Click below to read the Press Release! 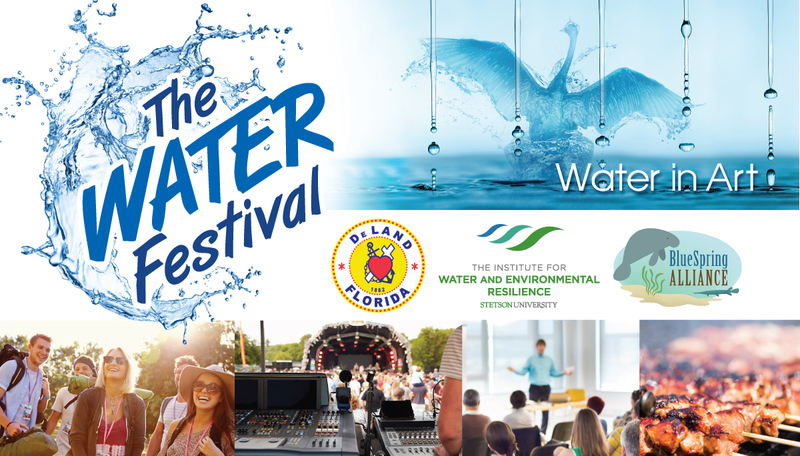 See you at The Water Festival! 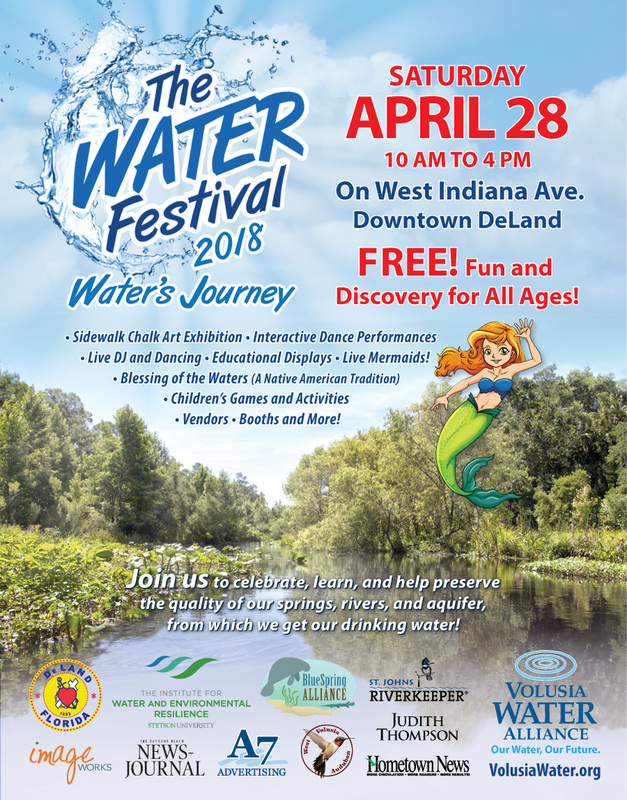 The Volusia Water Alliance invites local chalk artists to participate in an event to be held Saturday, April 28, during our 2018 Water Festival in DeLand, Florida. An honorarium of $150 will be given to each chalk artist. Deadline for applications is March 30, 2018. Click here to download information and application. Detailed Schedule of Presentations HERE. 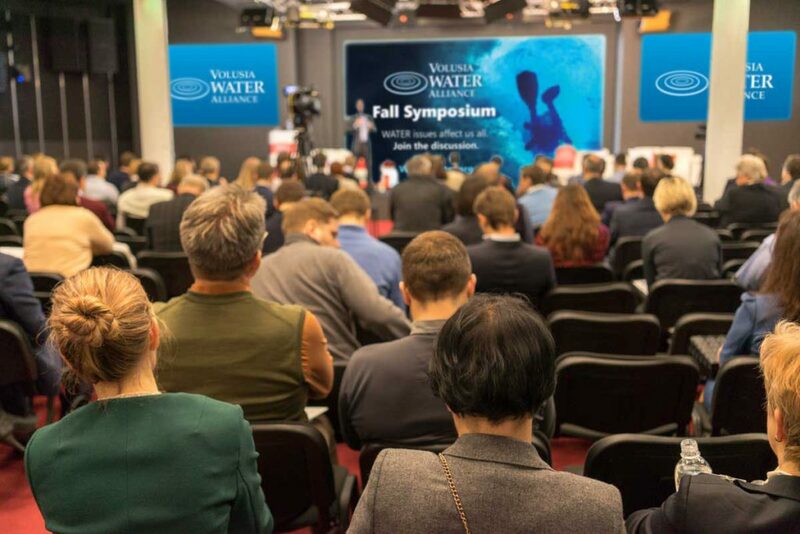 Hear short presentations by and for civic leaders, utility departments, and water management organizations about problems we’re facing and possible solutions. Enjoy lunch and an eye-opening film that follows a team of divers through the Floridan aquifer, with a presentation about the source of drinking water beneath our feet. Catered lunch of organic wraps and chips provided for $11 per person. Choices include Turkey with Cheese, Tuna, or Gluten-free Vegetarian wraps. Select lunch preferences with registration HERE. Attend informative, public-oriented presentations about our water levels and flows, protection and recovery strategies, saving our springs, the St. Johns River, and the urgent need for neighborhood involvement. Then, participate in round-table discussions to share your ideas. Top off the day with craft beer tastings, a brief presentation and tour of the brewery at Persimmon Hollow Brewing Co. Admission is FREE to attend all sessions; with an optional catered lunch for $11. Lunch includes a large wrap, chips and water, with your choice of Tuna, Turkey w/cheese, or Vegetarian wrap. Make your wrap selection in advance with your registration. Water issues affect us all. 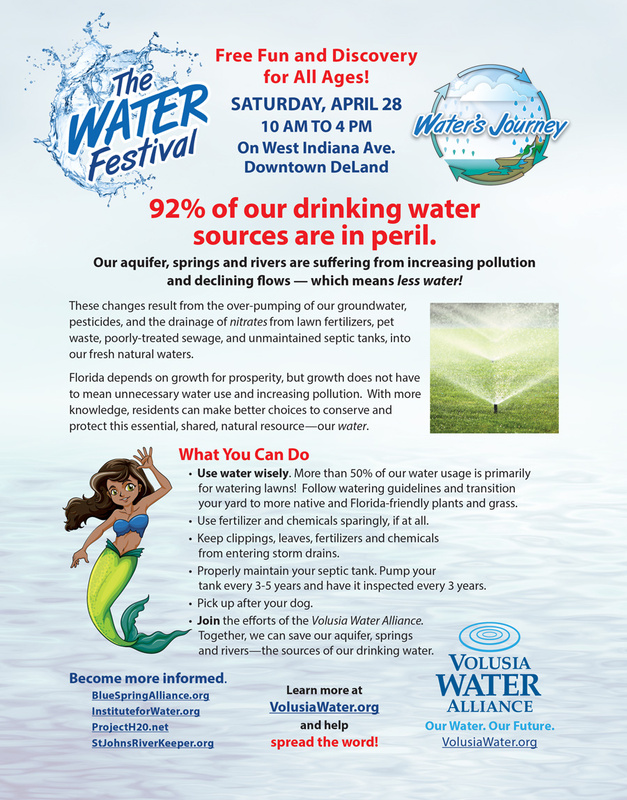 VOLUSIA WATER ALLIANCE produces The Water Festival in DeLand, Florida, geared to all ages to increase awareness about the conditions of our natural water sources, and to foster collaboration and engagement toward strategic solutions.